Over the last generation, activists, journalists, and researchers working in Latin America have increasingly faced the challenge of operating in areas affected by chronic police and non-state violence. Further, rising crime rates are leading a growing number of scholars to conduct research on high-risk topics, which involves gathering data on communities that experience conflict, writing and publishing on these difficult and sensitive issues, and developing and implementing programs to deal with the needs of communities affected by violence as well as the wider conflicts in which those communities are embedded. Despite these trends, the literature on safe practices for those working in high-risk environments remains thin. 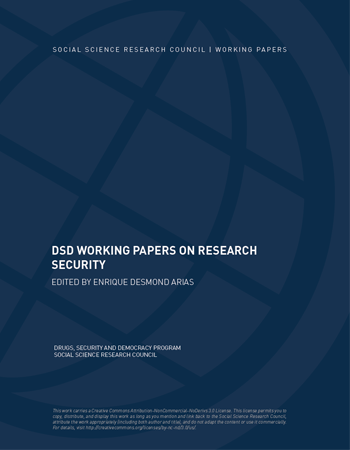 The DSD Working Papers on Research Security series seeks to address this deficit by examining a range of research security concerns, providing a framework to help those working in the region consider how they can enhance their own safety as well as the safety of their associates and research participants. The DSD Program is funded by the Open Society Foundations. The program is a partnership between OSF, the SSRC, Universidad de los Andes in Bogotá, Colombia, and Centro de Investigación y Docencia Económicas in Mexico.